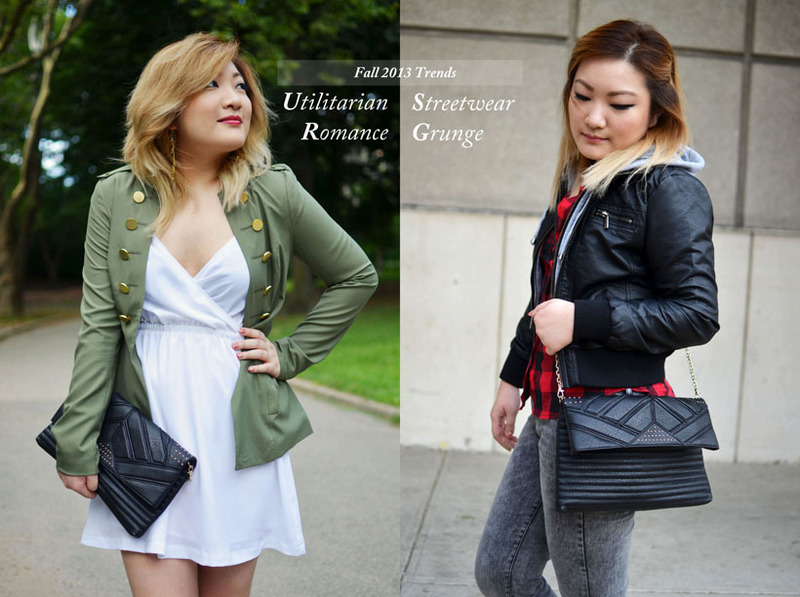 Here are two looks I’ve created for searsStyle‘s Fall Fashion Forecast, sponsored by Collective Bias®. Fall is fast approaching and it’s time to update the wardrobe with some key trend pieces. I’ve been in love with both military and streetwear inspired looks, so I wanted to create outfits based on those two trends. The fashion for this Fall season feels masculine and structured with darker hues, more hardware and tougher textures. Personally, I’m looking forward to wearing a lot of leather and boots again! The first look I created mixes the toughness of the utilitarian look with a flowy feminine centerpiece. The second look plays on the 90’s grunge comeback with a sporty flair. This is a great transitional outfit for late Summer to early Fall. First, I need to talk about how obsessed I am with this foldover clutch bag. I can honestly see myself pairing it with a majority of my Fall outfits. It also converts into a crossbody bag (as seen in my second look), making it super versatile. Adding black leather accessories and/or shoes will instantly edge up any outfit. In this case, it helps create the contrast between the feminine dress and structured jacket, completing the look. For this outfit, I wanted to try incorporating a little grunge into my wardrobe. As someone who had to wear a uniform to school until high school, I tend to stay away from plaid. The one I’m wearing has embellished pockets which takes away some of the masculinity. Also, a classic red and black pattern is a safe bet when trying this new trend. Like the girly girl I am, I also paired the outfit with glitter low top sneakers. The overall streetwear look is not drastically affected by the bejeweling and glitter, but the small details really help add playfulness to the outfit. Another important detail that helps keep femininity in a tougher look is silhouette and cuts of clothing. The jacket I’m wearing is cropped, the shirt is tapered inwards, and the bottoms are slim. This helps accentuate your waistline and keep your figure!